Overview | Ostool AlNaqil Co.
Ostool Al Naqel was founded in 2009, and started with a fleet of 20 trailers servicing SASCO’s sites. It quickly expanded, scaling its operational capabilities and increasing the size of its fleet to serve broader regions faster, safer and more effectively. 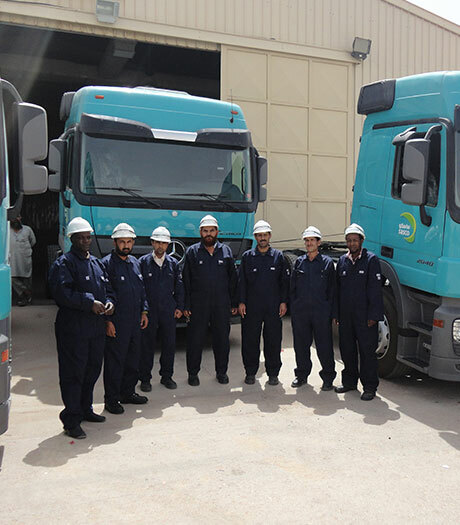 Less than a year after its inception, Ostool Al Naqel fleet grew by 50%, and by the start of 2011 the fleet had 60 trailers and tankers in operation, servicing all regions within the kingdom of Saudi Arabia. Ostool Al Naqel continued to grow and increase its fleet capacity throughout 2012, 2013 , 2014 and 2015. The company’s operational capacity has been consistently growing each quarter in conjunction with the management vision and the provision of highly skilled human resources for management and supervision. Today, Ostool Al Naqel aims to maximize the utilization of its fleet by providing full and complete end-to-end supply chain solutions. Ostool Al Naqel is part of SASCO’s group of companies, and is present around the kingdom of Saudi Arabia, this allows us to provide our customers with the best transportation services, support and advice. For any inquiry or quotation requests, please contact us and we will get back to you the soonest.